From CHUS, Sherbrooke, Québec, Canada. Neurologic symptoms in patients with rheumatoid arthritis (RA) are most often caused by osseous compression, affecting the cervical spine or peripheral neurologic structures. CNS involvement in RA is infrequent, consisting of CNS vasculitis or meningitis with or without meningeal nodules.1 When meningeal infiltration is seen, symptoms of presentation can include focal neurologic deficits, seizure, cranial nerve dysfunction, or altered consciousness.1 Here we describe a patient with an unusual presentation of rheumatoid meningitis. A 70-year-old man with a known history of long-standing poorly controlled RA, high blood pressure, and hypercholesterolemia presented with acute-onset right-sided hemiparesis, subjective sensitive symptoms, and a mild headache. On admission, right hemiparesis predominantly affecting the leg (Medical Research Council [MRC] 0/5 in lower limb and MRC 3/5 in upper limb) and right hyperreflexia and extensor plantar response were noted. The patient was admitted with an initial diagnosis of left subcortical ischemic stroke. Neurologic deficits recovered overnight. Over the next days, the patient presented several stereotyped episodes of abrupt-onset right-sided hemiparesis and mild headaches lasting from 1 to 8 hours. An EEG recorded during one episode showed mild slowing, with diffusely distributed theta activity (7 cycles/s) and no epileptiform discharge. Neurologic examination was normal between episodes. MRI of the brain was notable for extra-axial high T2/fluid-attenuated inversion recovery (FLAIR) signal intensity, with gadolinium enhancement of the leptomeninges and pachymeninges, and thickening of pachymeninges over the left hemisphere, sparing basal meninges. No ischemic lesions were detected, including on diffusion-weighted imaging (DWI) (figure, A and B) Cervical spine x-ray was normal. Brain MRI shows fluid-attenuated inversion recovery hypersignal (A), meningeal thickening, and gadolinium enhancement (B) over left convexity. Meningeal biopsy reveals a perivascular infiltration of inflammatory cells with lymphocytes B and T. (C) Hematoxylin & eosin. (D) CD3 immunostaining, consistent with lymphocytes infiltration. Serum inflammatory markers were slightly elevated, and rheumatoid factor was positive. Pulmonary x-rays, purified protein derivative test, and serum quantiferon were normal. CSF analysis revealed slightly elevated white blood cells (68 × 106/L) with mononuclear predominance, and normal protein (0.47 g/L) and glucose (2.9 mmol/L) levels. Tests for syphilis and cryptococcus were negative. 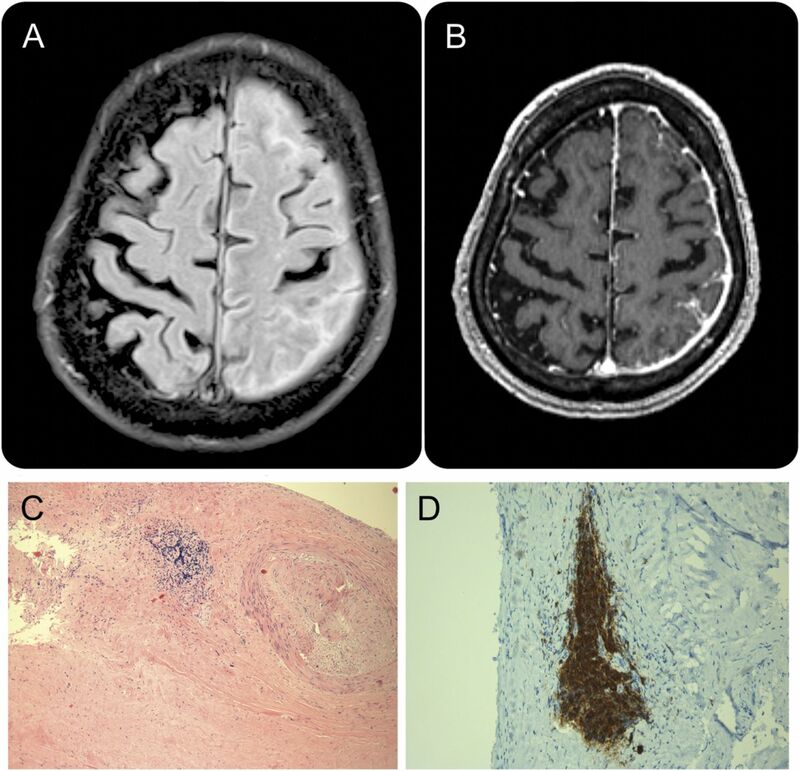 A meningeal biopsy revealed a perivascular infiltration of inflammatory cells with lymphocytes B and T, and no rheumatoid nodules (figure, C and D). Rheumatology evaluation confirmed highly active RA, with synovitis in multiple joints and severe erosive changes in plain radiographs of the hands. Rheumatoid meningitis was diagnosed, and methylprednisolone 1,000 mg IV per day was administered. Afterwards, no further neurologic symptoms occurred. The patient left the hospital with a high dose of prednisone (1 mg/kg) combined with hydroxychloroquine and sulfasalazine. The dose of prednisone was progressively reduced starting 1 month after initial presentation and reached 7.5 mg per day 6 months after presentation, with no recurrence. Head MRI obtained 5 months after presentation showed a 70% regression of the enhancing meningeal abnormalities. Rheumatoid meningitis is a rare condition. The largest case series described 19 patients.1 Most of them had long-standing (mean 14 years) seropositive disease with deformities, fewer than half had active synovitis, and 47% presented with altered mental status. Other complaints at presentation were cranial nerve symptoms (26%), hemiparesis or paraparesis (21%), or seizure (21%). A single patient presenting with progressive-onset, transient, short-lived, focal neurologic symptoms has been reported.2 Abrupt neurologic deficits are a frequent complaint encountered by clinicians, who need to recognize known stroke mimickers like subdural hematoma and brain tumors. To our knowledge, stroke-like onset of symptoms with rheumatoid meningitis has not previously been described. The underlying pathophysiology may involve cortical spreading depression induced by inflammation of the adjacent meninges. Vascular steal phenomenon appears less probable as no DWI abnormality was observed despite prolonged neurologic deficits lasting up to 8 hours. Phenomenology was not consistent with a clinical seizure, and no epileptiform discharge was registered during an episode. Author contributions: Dr. Bourgeois: acquisition of data and writing of manuscript. Dr. Rivest: critical revision of the manuscript for important intellectual content. Dr. Bocti: critical revision of the manuscript for important intellectual content.
. Inflammatory central nervous system involvement in rheumatoid arthritis. Semin Arthritis Rheum 1989;18:258–266.
. An unusual presentation of rheumatoid meningitis. J Neuroimaging 2005;15:286–288.
. Rheumatoid meningitis: a case report and review of the literature. Arch Pathol Lab Med 1983;107:129–131.
. Diffuse chronic leptomeningitis with seropositive rheumatoid arthritis: report of a case successfully treated as rheumatoid leptomeningitis. Mod Rheumatol 2009;19:556–562.
. Rheumatoid meningitis: an autopsy report and review of the literature. Clin Rheumatol 2003;22:475–480.
. Magnetic resonance imaging of rheumatoid meningitis: a case report and literature review. Rheumatol Int 2012;32:3679–3681.